At UniLink we recognize that Financial Institutions are at different stages of adoption or implementation of their Remote Deposit Capture program…. with varying degrees of results. We would like to work with you to identify ways to enhance your program. We have crafted a modular Remote Deposit Capture program that can be purchased independently or customized to meet your needs. Hardware – With the growing number of companies, marketing their scanners as the perfect choice, the decision to pick the right scanner can be overwhelming. There are a host of software providers, all with Remote Deposit Capture offerings with varying costs associated. We understand your loyalty to those providers, we also understand the need to be cost effective. Reduced costs of implementation through its web-based deployment, installation, configuration and maintenance. Enhanced security of payment information as scanned checks are captured directly to a secure website (no data is stored locally). Eliminated security risks by removing the need to physically transport checks to the bank. Scalability, to meet multiple presentation environments. Marketing - Are you uneasy about your ability to market or promote Remote Deposit? Does your Bank have limited resources? We have developed a customizable video that demonstrates the advantages and benefits of Remote Deposit to consumers. Customizable E-Commerce Platform - Does the thought of becoming a warehouse with inventory to manage seem unappealing? An online demo of this technology can be found at www.unilinkinc.com/bank - We eliminate the manual process of ordering and fulfillment! Bank officials can log in securely to view sales reports specific to their site to see when items are ordered, processed, shipped, and to obtain a tracking number. This allows for installation resources to be easily scheduled or to coordinate follow up discussions with your customers. Service - Certain conditions can lead to equipment malfunction. Have you provided for this type of scenario? UniLink is an Authorized National Service Depot for ALL scanners offered today. With over 100 years of combined technical expertise we can customize a program that fits your requirements whether it is Next Day Advanced Exchange or Time and Materials basis. We also team with all vendors regarding any maintenance offerings they provide. Consumable Supplies – this is an area that most banks do not consider when formulating their strategy for Remote Deposit, but can be a critical element for your customers. 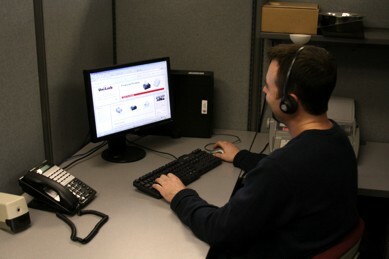 Through our website you or your customers can order supplies as needed and ship to various locations. National Supplies Manager available to take your calls or provide triage support for you or your customers. Payment options - At UniLink, we understand the complexities of today’s financial environment. That is why we offer a variety of payment methods including credit card, ACH, and direct invoicing. We also added the ability to Rent or Lease equipment to your options. This offering extends to banks and consumers. This option allows banks to customize their programs for their customers. We are your RDC partner! Contact us for more information regarding our sales support programs!